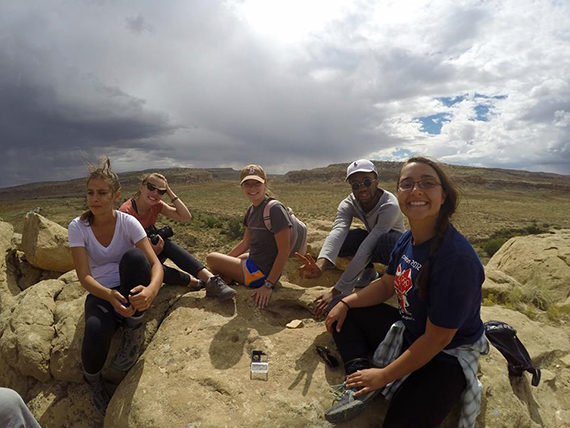 Last summer, Alia Davis ’18 returned to Santa Fe, N. M., to work on a video project she felt compelled to finish. Davis first visited New Mexico during the fall of 2015 with Colgate’s Santa Fe Off-Campus Study Group, led by Professor Sarah Wider. Because the study group emphasizes community-based learning, students were placed at various organizations depending on their interests and concentrations. “Community-based learning is the heart of our program, centers our curriculum, and provides the ethic of the semester,” Wider explains. Davis decided to help at the Keres Children’s Learning Center (KCLC) in Cochiti, a Pueblo outside of Albuquerque. The KCLC is an educational organization that fosters the importance of honoring and strengthening Keres, the Cochiti Pueblo’s traditional language, and revitalizing the Cochiti culture. As a Montessori school, KCLC implements a comprehensive cultural and academic curriculum for children ages 3–6. Davis chose the KCLC because she wanted to learn more about the Cochiti culture. “During the study group, my eyes were opened to all sorts of injustices that not only people in that area face, but also Native people all over the nation, and how Native Nations actively resist in extraordinary ways to reclaim who they are – ways like starting KCLC,” Davis says. The study group experience and working at the KCLC solidified her decision to minor in Native American Studies (she is a neuroscience major). Her work at the center included helping with craft projects, chaperoning field trips, and office work. “The kids loved her, as did all the teachers,” Wider says. In addition, Davis used her talents as a videographer to create a short promotional video that shows the children learning through the Montessori method and interacting with each other. When she left New Mexico, Davis knew she wanted to go back someday to reconnect with the people and to create an even better video. “After telling Dr. Wider about how much I appreciated my experience and the relationships I made, she and the founder of KCLC [agreed to] send me back,” Davis says. With Wider’s help, Davis made arrangements to return to the KCLC last summer. Davis secured funding through Colgate’s Max A. Shacknai Center for Outreach, Volunteerism, and Education (COVE) for a 10-day trip. Wanting to create a higher quality video for the center, she borrowed a hand-held camera and audio recorder from the university’s Digital Learning and Media Center (DLMC). During those 10 days, Davis conducted video interviews with parents, grandparents, and faculty members, asking them to reflect on KCLC. “For them, it was easy to talk about how the school has helped maintain the Cochiti culture and Keres language,” Davis says. The founder of KCLC asked that the interviewees speak in their native Keres, so she translated their statements to English and Davis created subtitles. Davis was later surprised to find that the center used the video on its official website. Watch here. Learn more about Colgate’s study groups.